Liquid dispensing Machine Model Intelligent MLDP – 6 is a custom oriented unit specially designed for dispensing battery solution during manufacturing SMF batteries. Click here for features and specification. During manufacturing of SMF batteries precise dispensing of battery solution is a major parameter affecting the product quality. Liquid dispensing Machine Intelligent MLDP – 6 or as per requirement is a custom oriented dispensing pump. The positive displacement version of our standard liquid peristaltic pump can transfer battery solution without any priming with accurate volume. The wetted part is only a peristaltic tube hence it does not contaminate the solution as well as no pump part gets effected by the battery solution. With acid dispensing machine you can set accurate volume of batterysolution with help our model Intelligent MLDP – 6.In these systems you can adjust individual pump ON time. ON time also provided in 1/10th of second. I.e. 000.1 to 999.9 second. All the pump will simultaneously on and off at different time as per settings. Hence difference of volume between the pumps can be nullified by adjusting individual timer. Additional one potential free contact will be providing for start to end operation for any extra activity. We can also provide customizing programming for process variable. With these differences between the volumes of pump can be nullified and also can used tube longer time with adjustment of ON time. Data protection of user parameter by specially RAM which hold the data for more then 10 years without any power. 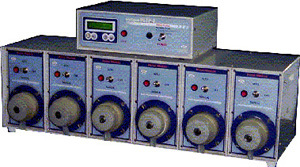 Versatile programming for Volume base dosing with variable flow rate for precise dosing. Constant flow for precise dispense with irrespective of power situation. Very easy key board operation. User friendly design. 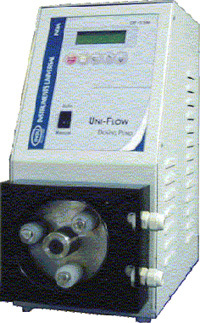 Low flow and Medium flow peristaltic pump systems. Portable unit weights only 18 Kg.